Rock ‘n’ roll bands took to the stage to help fight the battle against cancer down at The Oldy Club in Old Roan on Tuesday night. ‘Lankykats’, ‘The Rockin’ Relics’ and ‘The Rebels’ are but a handful of the groups who performed songs that took many back to the 60s, in hope of raising money for Stand Up To Cancer. 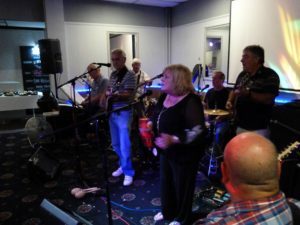 Along with the live music, the hosts were providing a free buffet with a raffle, and a ‘spot the ball’ contest that further supported the cause. Frontman of The Rockin’ Relics, Roy Montrose, told JMU Journalism: “The Tuesday nights here are now very special, and we’ve built it into a real community. Our success is due to everyone mucking in. As well as funding for Cancer Research, the weekly events also raise money for dementia and Alzheimer’s patients and their families. This cash goes to their support groups and helps to go towards days out, support and care work. Having already presented a big cheque of £2,200 to Steph Tickle, Merseyside area representative from Cancer Research UK, the organisers are eager to keep fundraising. There was a very lively atmosphere at The Oldy, with everyone in high spirits and many showing off their dance moves. Event organiser, Keith Hubbard, said: “I think the main thing really is to just raise as much as possible, as well as having a laugh at the same time. “We’re going to be doing this every week now as well as other events in between. We were at the Civic Hall in Ormskirk last week and actually raised £2,200 which was donated to Cancer Research.